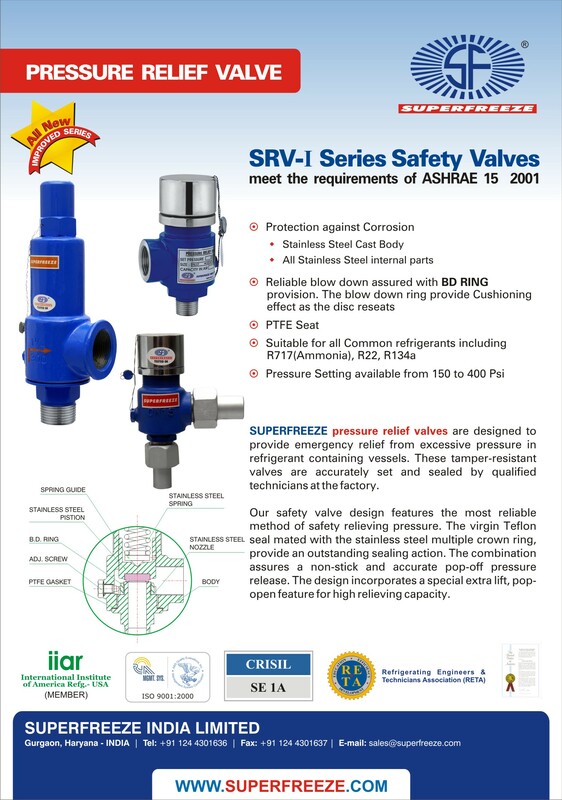 SUPERFREEZE SRV-Series pressure relief valves are designed to provide emergency relief from excessive pressure in refrigerant containing vessels. These tamper-resistant valves are accurately set and sealed by qualified technicians at the factory. 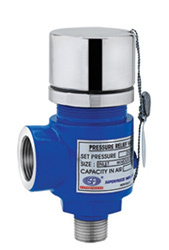 Our safety valve design features the most reliable method of safely relieving pressure. The virgin Teflon seal mated with the stainless steel multiple crown ring, provide an outstanding sealing action, The combination assures a non-stick and accurate pop-off pressure release. The design incorporates special extra lift, pop-open feature for high relieving capacity. Pressure relief valves helps meet the requirements of ANSI/ASHRAE 15-1997 SAFETY CODE FOR Mechanical Refrigeration as well as other world wide codes. This code requires pressure vessels of all refrigeration systems to be protected by a pressure relief device or other approved means to safely relieve pressure in the event of fire or other abnormal conditions. Once installed, is ready to vent to atmosphere any temporary excessive overpressure inside of a vessel. After discharge, these valves will attempt to reseat to minimize loss of refrigerant.